The Boring Company is proposing a project on the East Coast to build Loop and Hyperloop, high-speed underground public transportation systems. The Washington DC to Baltimore system would consist of the construction of a set of parallel, twin underground tunnels. This transportation system would create a significant public benefit due to decreased commute times, decreased urban congestion, decreased public transportation trip times, decreased transportation costs/fares, and decreased greenhouse gas emissions. Loop is a high-speed underground public transportation system in which passengers are transported in autonomous electric vehicles (AEVs) traveling at speeds of up to 150 miles per hour. See FAQ for additional information. Is the idea that the Loop will become the Hyperloop someday? Loop tunnels are designed to be compatible with Hyperloop requirements. Hyperloop is an ultra-high-speed public transportation system in which passengers would be transported in autonomous electric pods traveling at 600+ miles per hour in a pressurized cabin. A Hyperloop trip from DC to New York would take less than 30 minutes. Similarly, a trip from DC to Baltimore would take less than 8 minutes. Where would this tunnel alignment run? 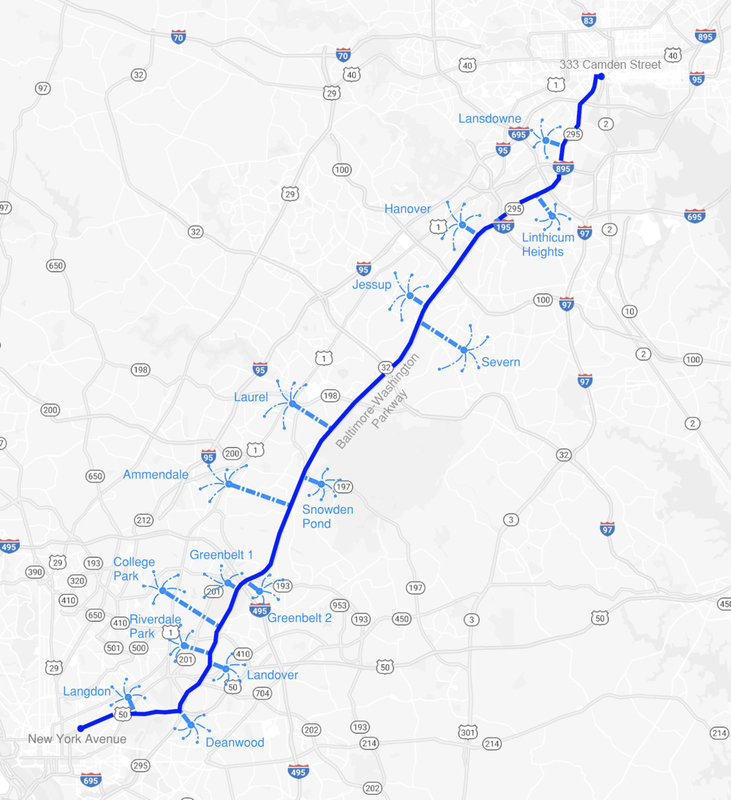 The proposed tunnels would run in parallel for approximately 35.3 miles beneath the public right-of-way of US 50/New York Avenue Northeast, the Baltimore-Washington Parkway, MD 295 and Russell Street from Washington, DC to Baltimore, Maryland. Where would the stations be located? Loop Stations would be located on private land and would provide access to enter and exit the Loop System. The Loop Station at the northern terminus of the alignment would be located at the parking area at 333 Camden Street, Oriole Park at Camden Yards, Baltimore, MD. The Loop Station at the southern terminus would be located at 55 New York Avenue Northeast, Washington, DC. Will there be intermediate stations between DC and Baltimore? Although not currently proposed, Loop enables future expansion opportunities to communities along the proposed tunnel alignment. Potential future expansions are not currently planned, and would require separate environmental review. Refer to the Potential Expansion Map below for the communities Loop could potentially service indicated by the blue spurs, and are included as a concept, not as a finalized proposal or alignment. Travel time to spots along the way would vary linearly with distance – in other words, a trip from DC to Greenbelt would take approximately 5 minutes and from Laurel to Baltimore would take approximately 9 minutes. With Loop, all trips are express, independent of the number of stops along the alignment. Specifics would be developed in cooperation with federal, state, and local agencies and the general public. The Boring Company looks forward to receiving feedback from Washington DC and Maryland residents on potential future station locations. The proposed Project would be 100% privately funded by TBC. Up to 70 Ventilation Shafts located on property purchased or leased by TBC adjacent to the tunnel alignment. The subsurface tunnels connecting the Main Artery Tunnels to the Ventilation Shafts would be between 12 and 24 feet in diameter. How deep will the tunnel be? While depth would vary, the proposed tunnels would generally be at least 30-feet deep to minimize the ability to detect construction at the surface. What land would this be under? The only subsurface land utilized for the project would be beneath public right-of-way and beneath private land owned/leased by The Boring Company. Would I see, hear, or feel the construction? No. The construction would be silent and invisible at ground level along the alignment, and no surface vibrations would be felt. The only way to tell construction is occurring would be through the presence of construction trucks driving to/from the “launch pits”. See FAQ for more details. How long would construction take? Construction would take between 18 and 23 months depending on the achieved speed of the boring machine technology. Which government agencies are involved in the process? How long would the trip take? Passengers would be able to travel from downtown DC to downtown Baltimore in approximately 15 minutes for Loop and in less than 8 minutes for Hyperloop. How much would a trip cost? The fares are not finalized but would be comparable to or lower than current public transportation fares. Is this for cars or people? Both, but pedestrians and cyclists will be prioritized over cars. Is this the same as MAGLEV? No. These are two separate and unaffiliated projects. The two projects employ very different transportation architectures and technologies. How can I get more information or submit feedback? Comments, questions, and station suggestions can be emailed to eastcoast@boringcompany.com. We will expand this project page over time to reflect the questions received.